The southernmost portion of the trail passes through a dense residential area, providing access to the riverfront and Detroit's Eastern Market. 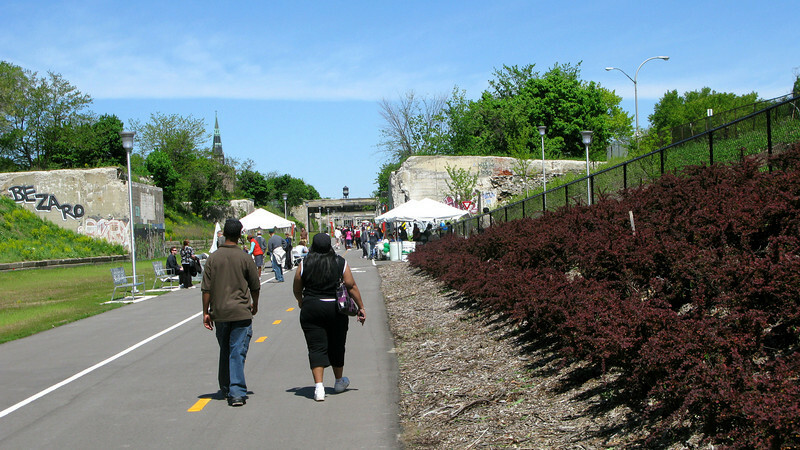 The Dequindre Cut is a 1.2 mile rail-trail that connects the Detroit waterfront to several residential and commercial areas. This project converted an abandoned, derelict railroad corridor into a greenway, preserving the right-of-way for transportation use and creating a valuable amenity for the city and for travelers. A $2 million federal TE award in 2004 leveraged a local match of over half a million dollars to construct the first segment of the trail. The full right-of-way is over four miles long, and an extension to the first segment is already under construction.